The Pines proprietor Jeremy Bernstein, aka Burnell Pines. 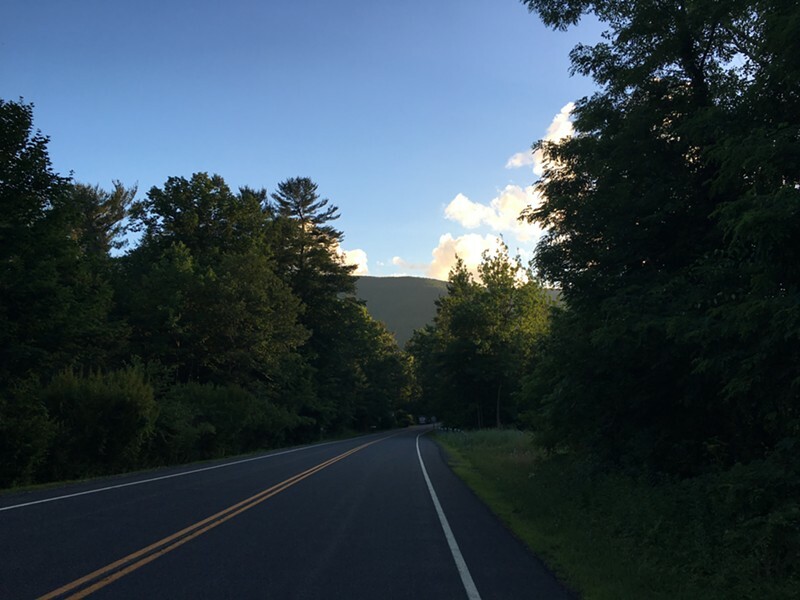 It just so happens that Jeremy Bernstein, aka Catskills-bred, folk-rock musician Burnell Pines, was looking for his next big thing when his friend’s car broke down on the side of Route 212 in Mount Tremper. The pair got out of the car in front of a tired-looking boarding house, and walked up to find help. For generations, the building had housed the Tiso family and their beloved Italian trattoria, which closed down in late 2015. That day, Joseph Tiso helped Bernstein, and in the same breath offered to sell him the building. “I told him, ‘I’m a musician and a carpenter, I’ve never run a restaurant!’” But the idea stuck in his craw as he mulled over his next move. 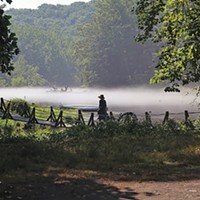 In 2016, Bernstein bought the 3.4-acre property with help from family, and began the laborious process of restoration and transformation. The Pines is a true roadhouse, hugging a curve in 212, across the blacktop from the Little Beaver Kill. A black sign heralds the hipster oasis from the road, but other than that, the outside looks fairly unchanged from the Tiso days, but the inside has undergone a radical makeover. 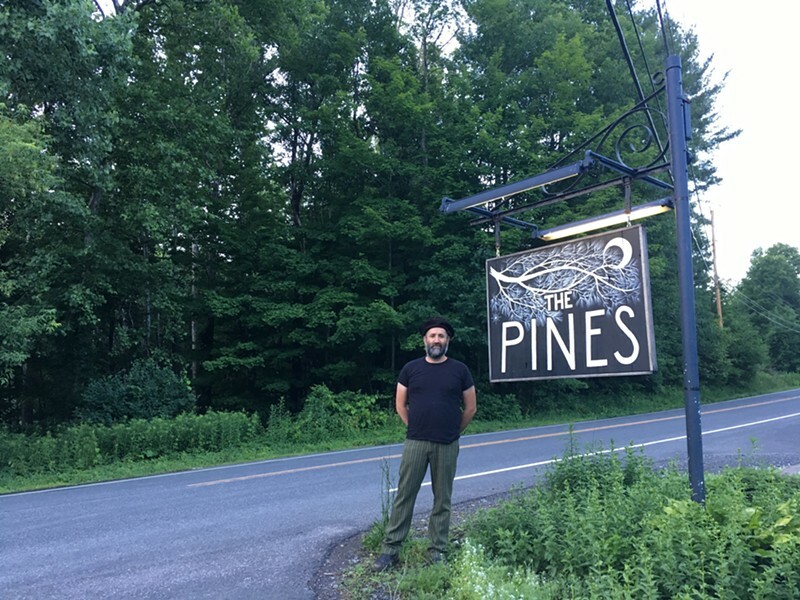 Bernstein decided to ignore the well-meaning but privileged advice to not open his doors until everything was ready, and has been working continually since The Pines debuted in the spring of 2017. His carpentry experience was key as he DIY’d a significant amount of the renovation. Bernstein pulled up sheets of linoleum to reveal original 1800s wood flooring throughout, scraped off decades of wallpaper, replastered the entire upstairs, and refinished all five hotel rooms. 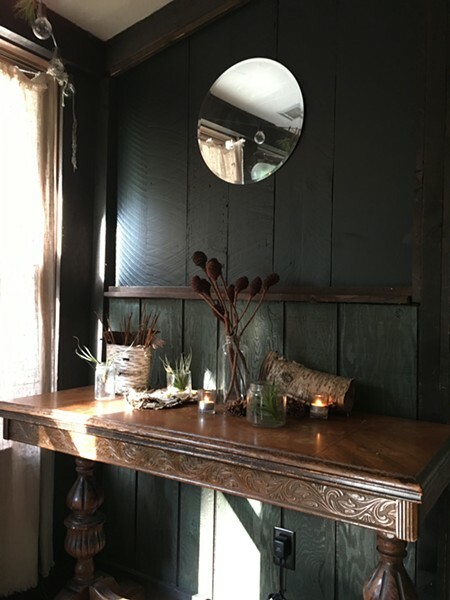 A decor vignette in the bar. The front door opens to a foyer and bar, which in turn lets out into a dimly lit dining room. On the front side of the building, a three-season porch has been converted into a second dining area. The window-lined space is bright and has a casual-chic atmosphere with dark grey walls and string lights throughout. 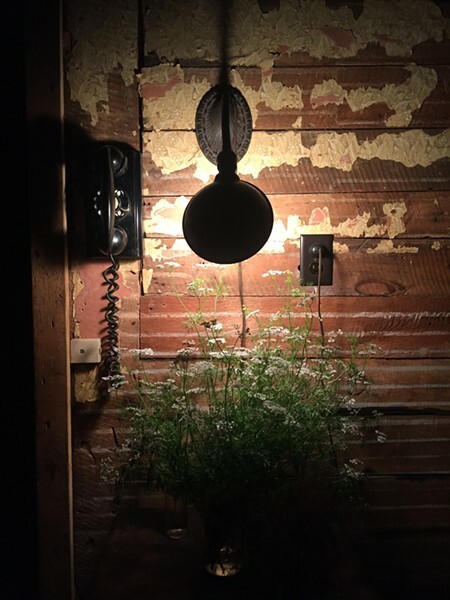 The restaurant is full of little, eloquent design vignettes—like the antique phone and sconce by the bar, or the vintage keyboard that was cut into a wall-to-wall hutch from the house’s earliest days. The dim lighting and wood-heavy decor create a lodge ambiance but the curated modern touches (and a lack of taxidermy), along with the predominantly Mexican menu balance out the vibe nicely. The three-season porch of the house has been converted into a bright, cozy dining area. Bernstein’s wife, Stacia Bolina is half-Mexican and couple has a long tradition of cooking Latin American dishes at home. So when it came time to menu plan for The Pines, this was the natural route to take. 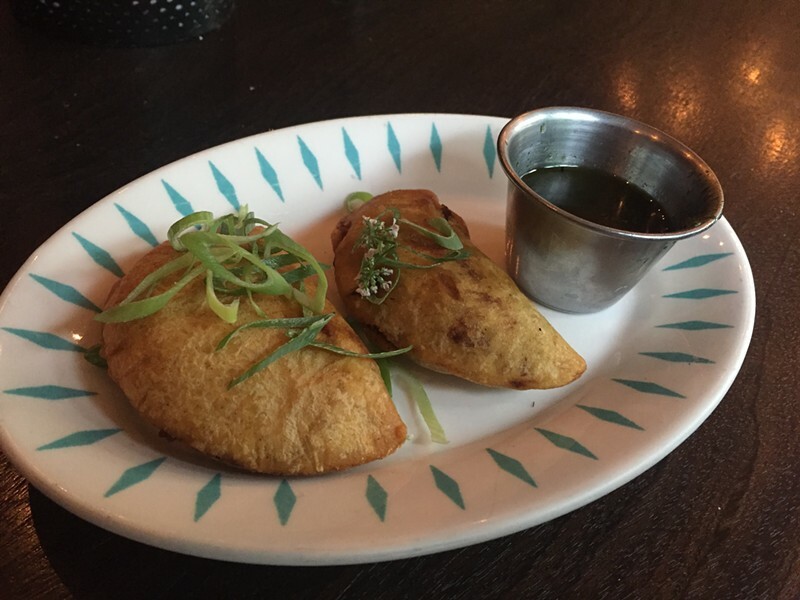 On a weeknight in late June, the specials included elote (Mexican street corn made with lime aioli, cotija cheese, and dusting of cayenne pepper) and succulent goat empanadas served with chimichurri. 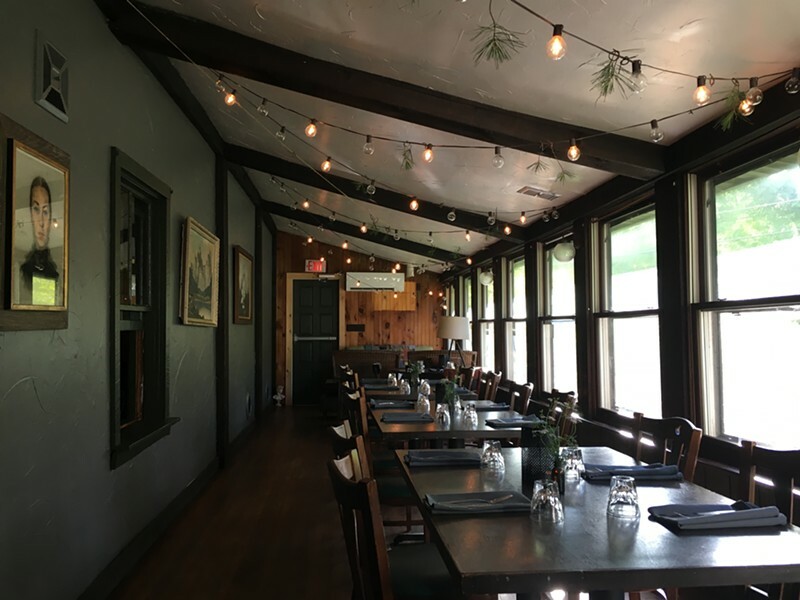 The regular summer menu includes a Chilled Cucumber Soup made with coconut milk, herbs, chili oil ($10); Tacos a la Pines, made with either chicken or cauliflower tossed in Colorado sauce ($14); as well as beef, vegetarian, and bunless burger options. The lodge has two private suites with their own bathrooms and three small bedrooms that share a washroom. The rooms are priced affordably (between $70-120 a night) and the whole floor can be rented for larger groups like bands and traveling circus acts. Bernstein warns that when there is live music, the noise does reach the second floor, so not the best option for families with young children (or uptight prigs). For an extra treat, Craig Thompson of Shandaken Bake, makes pastries for the hotel guests several times a week. 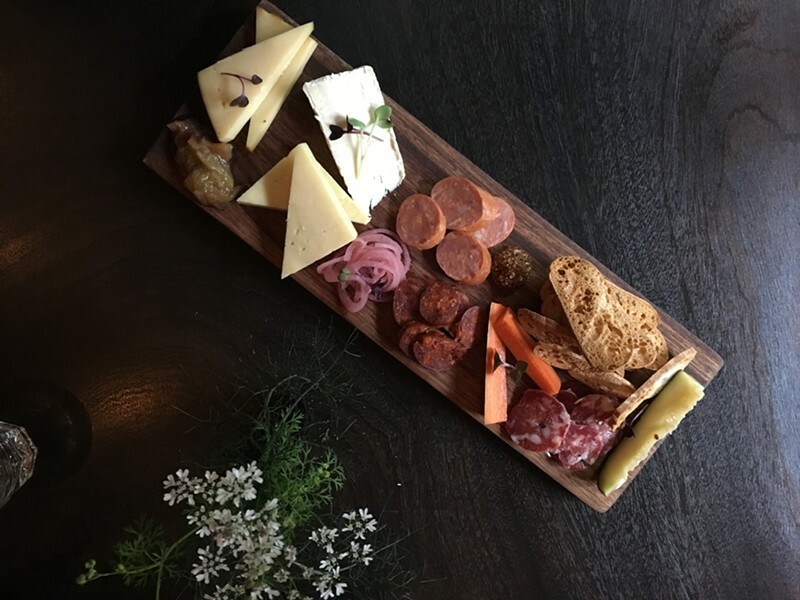 All the skills and relationships Bernstein has cultivated over the years have come home to roost in The Pines, from the renovation he undertook to the rotating roster of local musical acts that liven up the dining room on weekends. And the project is ongoing, and he looks to continue improving, renovating, and expanding the capacity of the space. 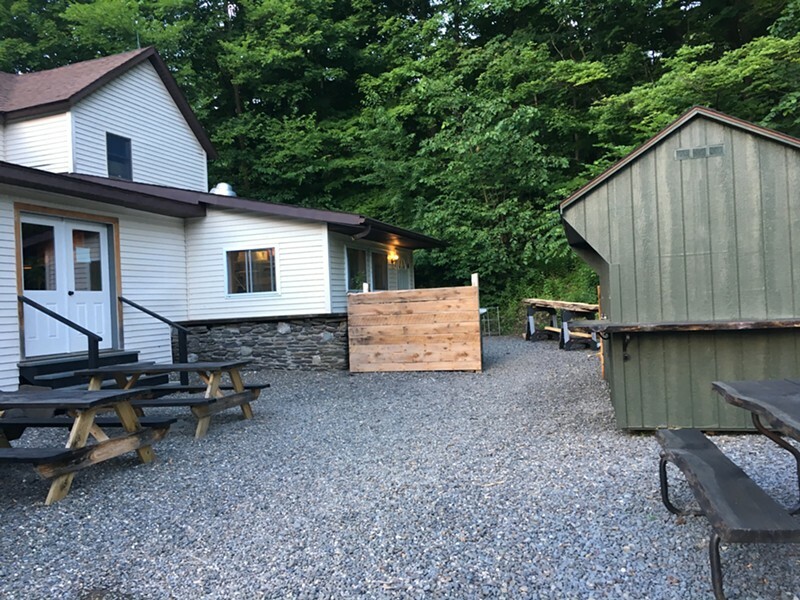 Bernstein, who has a liquor license for the existing restaurant, is in the (lengthy) process of acquiring a license for the back patio, which has a biergarten vibe with picnic tables and future food shack. 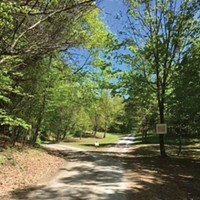 In the field beyond, today and tomorrow (July 14 & 15), from 11am to 6pm, The Pines will host the nomadic makers market Phoenicia Flea, which Burnell hopes is the first of many outdoor maker and music events. 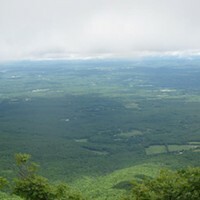 Though the full character of The Pines is still being defined, Burnell is setting the right tone—laid-back and genuine hospitality, comfortable aesthetic that blends mountain rustic with modern sensibility—a nouveau Catskills hospitality. Once Bernstein receives the proper approval, the backyard will turn into a biergarten with a food shack and a music stage.